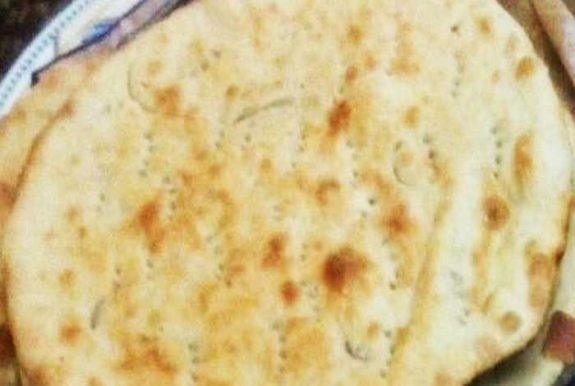 Classic Easy Naan recipe for home. It is a convenient naan recipe that you can prepare for your curry dishes in a short time. Add yeast, milk, salt and oil in flour and kneed well, keep it aside and wait for 4 hours and let it rise. Then don't bake them, turn on the roti pan or tawa (stove per tawa garam hone dein) and wait until it's hot and then make your bread on it on medium flame and let it get brown from the bottom. Now make holes using fork and brush the bread with milk. Put the bread in oven and just grill them until they turn brown. Just brush them with butter or ghee at the end. Another Recipe in Urdu: 2 cup maiday mein one tbsp salt, one tbsp sugar, half tbsp baking soda, one tbsp oil aur pona cup dahi daal ker pani say dough goondh lain. Phir isko two hours k liyay rest day dain. Pairay banayien bail kar phir ooper pani laga lain. Pani lagi side taway per dalain. Tawa ziada garam na ho medium ho. Jab bubbles ban'ny lagien tou taway pe ulta ker k ooper vali side pakaein four sides say pak jaein tou butter sy brush kr lain.